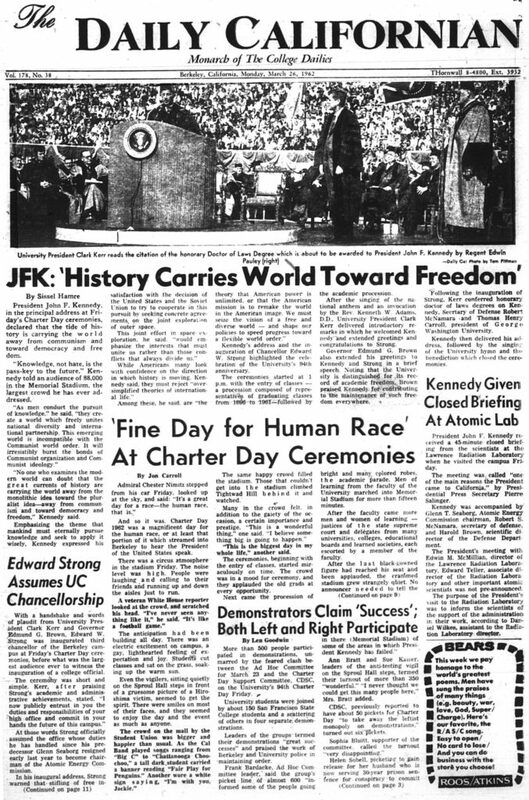 On March 23, 1962 – 55 years ago today – Former president John F. Kennedy was the speaker at a packed Charter Day ceremony at Memorial Stadium. “The New Frontier owes as much to Berkeley as it does to Harvard University,” Kennedy told the astoundingly large crowd of 88,000 students, faculty, staff and alumni. Kennedy spoke at the 94th Charter Day celebration, an event commemorating the university’s founding in 1868. He wasn’t the first president to speak at UC Berkeley, but he was the last sitting commander in chief. His appearance drew unequaled throngs, barely 14 months into his presidency. That gorgeous spring afternoon was also the apex of Charter Day, which, like many campus traditions, began to fade in the 1960s. Regardless of what was to come, The Daily Californian knew it was covering history. Three staff members – Jon Carroll, Tom Pittman and Len Goodwin – were instrumental in that coverage. Here are their stories. Carroll, a San Francisco Chronicle columnist for 33 years, was a general assignment reporter for the Daily Cal. Unlike the many security changes after Kennedy’s assassination, Carroll and many other students were steps away from the president. While Carroll was inside the stadium, beat reporter Len Goodwin was covering the “successful” demonstrations that were happening outside. “The protesters were well received by the campus because there was a general understanding that everyone had a right to do what they were doing and that it was part of the process,” Goodwin explained. While the president was praising California and its many achievements, about 600 students were picketing at Bancroft Way and Telegraph Avenue. “Some reporters were tasked with interviewing the president, but I got the assignment of covering the protests because I had a fair amount of contacts on both sides,” Goodwin said. Goodwin’s article featured comments from Helen Sobell, the wife of a scientist accused of espionage, and several other groups that expressed the president’s faults. Back inside the stadium, head photographer Tom Pittman was there to capture the event on a classic Speed Graphic 4×5 camera. Wearing his Daily Cal press pass and standing next to veteran White House reporters, Pittman was only a few feet away from the stage when then UC president Clark Kerr awarded the president an honorary juris doctorate. “I had a region on the grass at the front of the chairs I was allowed to walk around in. I did that, and shot several pictures of various views,’’ Pittman said. Of course, March 1962 was a far different era in politics, culture and just about everything else. “The issues at the time were not that big. It just felt like, ‘Let’s get together and give him a nice welcome,’ ” Carroll said. 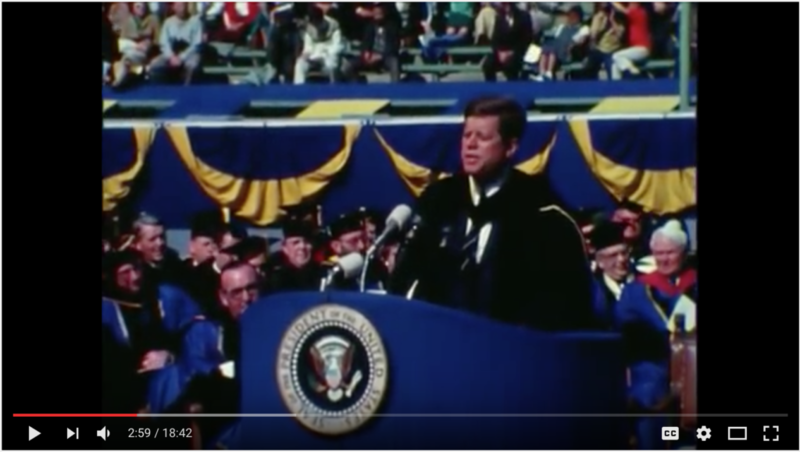 Click below to view President John F. Kennedy speak at the 1962 Charter Day Ceremonies.